Home / Think Tank Airport TakeOff: Finally a rolling photo backpack that works! The new Think Tank TakeOff builds on Think Tank Photo’s excellent line of carry-on size rollers, adding hidden backpack straps on the back side. The result is a bag that meets international and domestic airline carry on requirements, while still able to serve as both a solid roller and casual backpack. Folks coming on safaris with me are always asking about a roller bag that can also be used in a vehicle and loaded onto small planes. The TakeOff is the first one I’ve used that fits the bill. The bag has an expandable front pocket that fits a laptop – preferably in a Think Tank Artificial Intelligence sleeve. Fortunately, anyone purchasing a Takeoff (or other Think Tank roller) this month will receive a free AI sleeve! There are also the usual zip pockets in the lid of the bag, as well as the usual excellent detachable rain cover. The side of the bag can accommodate a monopod or tripod with the included straps and tripod holder. Fully loaded (with all of the above gear and small accessories, but without a laptop or tripod), the Takeoff weighs in at just under 34 lbs. The Takeoff incorporates another innovative feature. To increase stiffness without adding bulk some of the internal dividers are stiff, but have cut outs where a camera and lens combination can pass through. This is a great idea, and mostly works very well, although personally I would have preferred that the long lens cut out was a little closer to the center of the bag. As usual with Think Tank, the build quality is excellent, zippers are a fused version for maximum abrasion resistance, and they provide their “No Rhetoric” warranty should the bag ever have trouble. You can get the Airport Takeoff directly from Think Tank for $329, including a FREE AI laptop sleeve, or snag a similar deal on any of their other rollers during the month of May. You can also purchase the TakeOff from B&H for the same price – although I don’t think you get the free AI sleeve that way. Exterior - All fabric exterior treated with DWR while fabric underside is coated with PU for superior water resistance, YKK® RC Fuse (abrasion resistant) zippers, 420D velocity nylon, custom designed extra tall skid plates, replaceable in-line skate wheels, rubberized laminate reinforcement, ultra-stretch pockets, 3D air mesh, SpanKodra side pockets, nylon webbing, 3-ply bonded nylon thread. Interior - 210D silver-toned nylon, PU backed velex liner & dividers, 2x PU coated nylon 210T seam-sealed taffeta rain cover, closed cell foam & polyethylene (PE) board stiffened dividers, clear PU mesh pockets (non-PVC), 3-ply bonded nylon thread. My Lowepro X200 has gone all over the world with me since 2009, with its hybrid design allowing the rolling shell to be separated from the backpack in case it needs to be gate checked (the backpack section can then be carried on). It is solid as a rock and includes a built-in lock. 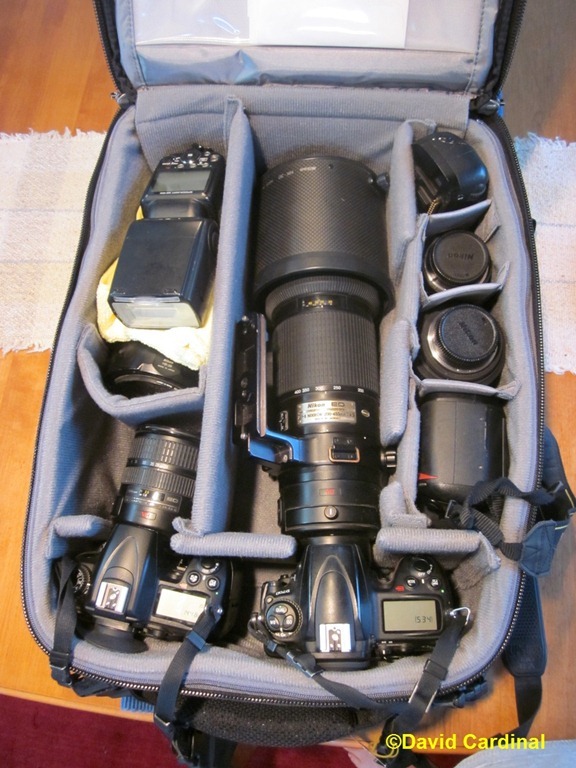 Because it is two bags in one – causing me to dub it “the most versatile camera bag ever”, it is larger than the Airport Takeoff, even though it doesn’t hold any more gear. The X200 is excellent situations where I can leave the roller section “in the city” and take the backpack out on location, but the dual design means that I have to choose between the backpack and the roller. I can’t simply use the roller and then grab the straps to sling the bag over my shoulder at a sporting event or when heading out on safari. The bag’s integrated lock is handy in the event you need to check it or if you leave the roller section behind when you head into the bush and want it locked (when I use the bag on our Alaskan safaris, for example, the roller shell stays at the hotel in Anchorage while I take the backpack section on the smaller planes). By contrast, the Airport Takeoff lets me have a single, slightly smaller, bag that I can take everywhere, using it in airports, at sporting events, and in safari vehicles. Because neither the straps or the roller unit can be removed from the Airport Takeoff, it could be a little harder to fit into extremely small overheads (the kind you find on commuter prop planes) than the backpack section of the X200. The compact design of the Takeoff pays a slight price in the handle, which is not as solid as the one on the X200. It comes with a warning not to lift the bag by the handle when full, while my X200 has taken quite a bit of horsing around getting it on and off rental car shuttles and escalators – even with a briefcase slung over the handle. A choice between the two bags really comes down to which design you prefer. The Lowepro X200 as a larger bag with removable backpack or the Think Tank Airport TakeOff in a smaller package that integrates both roller and backpack into a single unit. 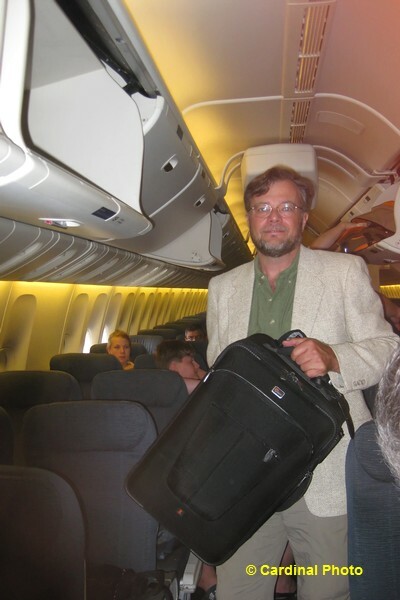 One other difference is that the TakeOff zips open the “long” way, like most traditional photo backpacks, while the X200 zips open the “wide” way, like most traditional suitcases and roller bags. The backpack straps can be tucked away yet remain exposed while the Airport TakeOff™ rolls along. When you are ready to use it as a backpack, simply collapse the extendable handle and pull out the backpack straps. 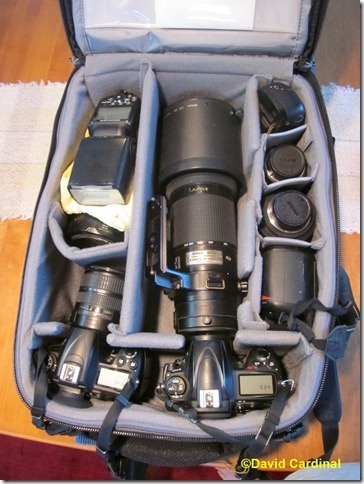 The TakeOff™ can carry regular size DSLRs across the top of the bag and/or pro size DSLRs along the sides. A Nikon D90 and D3 are shown above. The rear panel covering can be easily zipped open or shut to hide or expose the backpack straps. A tripod or monopod can be carried on the side of the Airport TakeOff by using the straps and tripod cup included with the bag. A monopod can be carried in the stretchable side pocket and stabilized near the top of the bag with the included monopod strap. The cable and lock are inside the clear pocket and underneath the front flap on the Airport TakeOff. The Artificial Intelligence 15 fits in the front pocket. Open the zipper flap on top of the Airport TakeOff to reveal the extendable handle.